Mr. Frank E. Sampson became a Circuit Chancellor when comparatively young. He is now only thirty-nine, and has been steward of the Bristol Second ten years. For ten years he has been Superintendent of Essex Street Sunday School, in which sphere of labour he takes especial delight. At the present time he is Treasurer and President of the Bristol South Christian Endeavour Union, and has entered upon his third year as President of Bedminster Free Church Council. He has recently been oppressed to stand for a vacancy in the City Council, but for the time being had to decline. He delights in acknowledging how much he owes to his godly parents who were devoted adherents of our church, and whose memory is much honoured in the circuit. He is a Senior Society Steward and Trustee for two chapels. Of singular piety, and widely respected by all sections of the community, he worthily adorns our church. Frank was born in 1867 at Clifton, Gloucestershire, to parents Henry and Hannah. Henry was a brick and tile maker. Frank was an engineer, becoming an employer at an Iron Foundry. The 1911 census describes his occupation as Engineer, Mechanical and Construction. 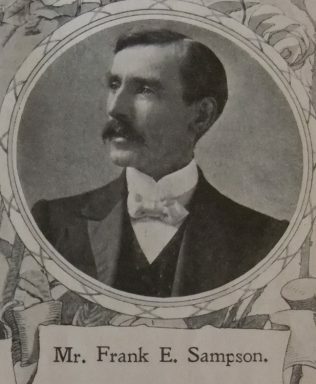 In 1926, Frank was Civic Sheriff of Bristol. Frank married Sarah Mary Terrett (1866-1930) in the summer of 1895 at Bedminster, on the south side of Bristol. Frank died on 21 May 1946 at Walton St. Mary, Clevedon, Somerset. He left an estate valued at almost £38,000.